Thank you for supporting Portland Audubon! Dawn chorus occurs when birds sing at the start of a new day, and for many species that begins in the dark morning hours. 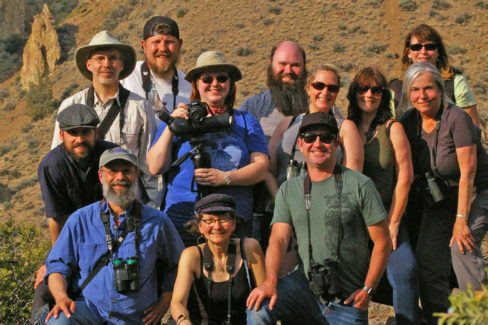 On May 15th, a group of 12 individuals met an hour before sunrise to embark on a 17-hour birding extravaganza, traveling more than 350 miles on a quest to find birds. This was Backyard Bird Shop’s team, the Retailed Hawks, participating in Audubon Society of Portland’s 2018 Birdathon! That trip was incredible on many levels. The weather was ideal, our route offered beautiful scenery amid changing habitats, and the team member’s cooperation and consideration of each other was inspiring. To top it off, the birds were out there to be found. Our final count? Drum roll please…110 species! We thank our Retailed Hawks for their personal fundraising efforts. When combined, our team members raised over $6,700. We also thank the staff who stayed behind to tend the shops so others could go. And finally, we thank YOU, our customers, for making contributions to Portland Audubon while visiting our stores during the month of May. How satisfying for all of us to know that the over $12,000 we raised together will go to promote the understanding, enjoyment, and protection of native birds, other wildlife and their habitats.